In “The Empowered Teacher: Proven Tips for Classroom Success”, the author explores the challenges that teachers commonly face and provides ways to enhance their teaching and classroom management methods. The book packs valuable tips and insights that teachers can benefit all aspects of their careers. After retiring as a K-8 principal in 2012, Dr. Susie Wolbe was certain that her purpose was far from over. Now, she extends her expertise by reaching out to teachers and families and helping them guide children in the best ways possible. In her book, she aims to help educators understand and learn how to become better at what they do as they improve children’s performance in school and in society. 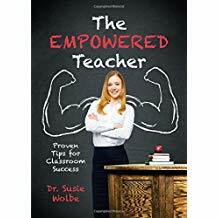 Valuable learning strategies and methodologies await teachers, and even parents, as they pick up Dr. Wolbe’s insights and expertise in The Empowered Teacher. It goes beyond the four corners of the classroom and touches different aspects of being an educator—proving that teaching is more than preparing lessons and activities for students every day. Channeling her own experiences as an educator, Dr. Wolbe lays down different strategies that help students improve their attention and focus while learning different subject matter and, at the same time, enhancing their sense of empathy, gratitude, and appreciation for oneself and others. Additionally, this book provides insight on how to thoughtfully give activities to the kids without compromising their work-life balance. As different aspects beyond the classroom are explored, readers are given guidance on how to build stronger and more positive relationships with their students, the parents, and their colleagues. Also, teachers are encouraged to improve their own self-care habits, inspiring them to do and achieve more, yet with less stress and anxiety. Dr. Wolbe’s strategic and practical advice allows educators to see their profession from a different perspective in order to embrace more creative ideas and strategies that will benefit their careers and the children that they will teach. Indeed, The Empowered Teacher brings a holistic approach that helps transform how educators guide students and their performance in the classroom, and helps them reach out to administrators and teachers to extend this kind of approach beyond school. In summary, her approach advocates bringing the fun and joy back into the classroom, as well as building good working relationships with colleagues. In order to inspire more educators all over the world, The Empowered Teacher will soon be on display during the upcoming 2018 Miami Book Fair. Happening on November 11-18, 2018, this highly-anticipated event is definitely a must-see for book lovers and literary fans alike. Be sure to save the dates! Written by: Susie Wolbe, Ed.D. Dr. Susie Wolbe was a classroom teacher in both public and private schools before serving as K-8 principal in a private school for 14 years. She has a B.S. and M.S. in Elementary Education, an Ed.D. in Educational Supervision with a Concentration in Curriculum and Instruction, and is certified as a Mindful Schools instructor. She currently works with adults and children in both group and individual settings, and is a continuing education provider for the state of Texas (#902209). Dr. Wolbe has used mindfulness strategies to learn how to manage life’s sometimes-overwhelming demands. She is now committed to helping other people do the same, especially as it applies to students, educators and parents. As Dr. Wolbe says, “Teaching, learning, and living life just doesn’t have to be all that hard.” Beyond the classroom, Dr. Wolbe has manufactured children’s clothing and holds a real estate broker’s license. She and her husband have five children and eight grandchildren.